Imagine this; you’ve booked a three-day trip to Miami. Would it make a difference in how you pack, the airline or hotel you select, even your mindset, based on whether the trip was for a vacation or a business meeting? Of course it does, and any reasonable person would start with the purpose of the trip and then plan from there. With the intense focus on developing personas and mapping the buyers’ journey, many marketers are skipping that first piece of the journey, or the “purpose.” Marketers may know the buyer and their purchase behaviors – but they don’t fully understand their “why” or what motivates them to choose their organization. Based on research from a group of clients representing hi-tech, financial and information services with more than $1B in revenue, I’ve pulled together four common buyer groups. This is not intended to be “statistically significant,” but rather a framework for considering the uniqueness of buyer motivations. Try matching your customers to the segments (below). They should be easily identifiable and you may find a similar distribution. Here is a short description of each group. The Lucky (10-15%) – prospects that your outbound sales and marketing efforts have reached with the right message at a time when they were open to discussing how you could solve a specific problem or need – a new acquisition. The Looker (15-20%) – buyers who are actively searching for information/solution that can help them with a need or problem. They find you and decide to engage in the sales process – a new acquisition. The Loyalists (25-30%) – your “champions” that have used your products or services in the past and faithfully bring you with them wherever their career takes them. The Legacies – (30-35%) they inherit the existing relationship and may, or may not, be familiar with your products and services. Each group ventures through the journey and engages with sales and marketing channels with a different mindset and set of motivators. It impacts how they interact with the decision-making group and perhaps, most importantly, their willingness to advocate for your brand and/or product. Hence, why you need to consider their emotional involvement in the process. Why? Because emotions fuel the wheels of motivation; they can drive them forward or put them in reverse. Your communication should reinforce their decision to work with you. Any awards or recognition received should be passed along immediately thanking them for their contribution. Any bad news should be quickly communicated and explained via a call, not digitally. Know this group thoroughly, understand their social engagement and make sure to track their career progress. The relationship is personal, so recognize and reward it. On the opposite end is the “The Legacy” group. Although they inherited the relationship, they may not be motivated to keep it. 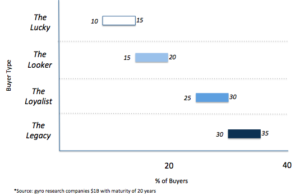 The potential issue, according to Sirius Decisions 2016 B2B Customer Experience Study, is that “80% of B2B purchasing decisions are influenced by past customer relationships” and that experience, most likely, was not with your organization. Assume low emotional involvement and do your homework on this audience. Here are some helpful hints on engaging them. We know from our research on the emotions executives experience in their careers that four emotions are always present, 1) excitement, 2) anxiety, 3) confidence, and 4) pride. The “word cloud” is taken from research on the emotions experienced when an executive moves into a new role. Take advantage of a “Legacy” person being new to the role and leverage the excitement they feel by communicating how your product or service can benefit them professionally, and personally. Additionally, emphasize how your products and/or services may reduce their anxiety or apprehension that comes with the new responsibilities. “The Looker” is motivated but may not yet be emotionally engaged with your organization. The thrill of discovery quickly fuels emotions. Continue to feed it by understanding their behaviors and journey. Give them reasons to personally connect to your solution or brand. Use insights to teach them something new about their business, needs, and/or their customers. The “Lucky” become aware much later, and may never really become emotionally involved. For them this may be purely a transactional relationship. Focus on reducing risk that they may associate with making a bad decision. Use industry-specific case studies and customer testimonials to build their confidence in your capabilities. If you’ve ever said, “I don’t feel like doing it” you get how emotions impact motivation. Your task now is to understand why your customers take the “journey.” Pushing an organization forward to a purchase decision is a struggle. Your advocate will become fatigued along the way. To win, you have to understand the emotions involved at key moments to motivate them to keep moving because at some point, they won’t feel like doing it either.